Tis saddens thy eyes that we must depart. I am truly saddened by the fact that I must break habit. This is the only class that I enjoyed waking up for. I would get up at an hour before the train arrives, take a little walk to the station's little deli stand, buy myself a cup of coffee, and wait for the train. There were a few occasions where Kolin and I would run into each other and b.s. The train ride there was DEFINITELY shorter than the ride back. The class made one exercise, no excuses, a plus in my book. I love learning about how neighborhoods started, this class hit it right on the nose. 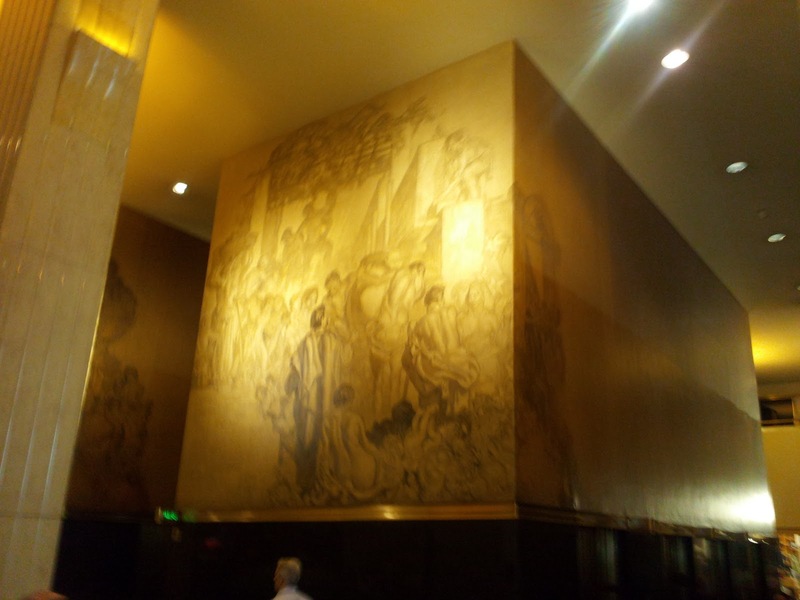 Every week was a new adventure into the industrious city and there was never a dull moment, except for the visit to Museum of the City of New York. This is our final class together and we will be seeing the most interesting museum of this course, the Tenement Museum. It has been a great seven days accumulated. I made great friends during the course of this program and I will find it hard to depart. The day seems interesting and lunch seems filling so let’s see where Mike and Meritta take us! I love me some cupcakes! I know that is grammatically incorrect so do not penalize me for it, Mike!! 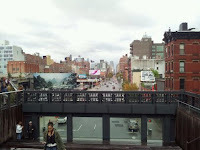 We took the F to Delancy where the Essex Street Market is. 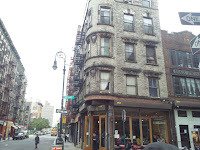 From the outside, I am thinking it is similar to the Chelsea Market. However, as we walk inside I am surprised to see that it’s just like a Compare Foods and Tri-County Flea Market combined. 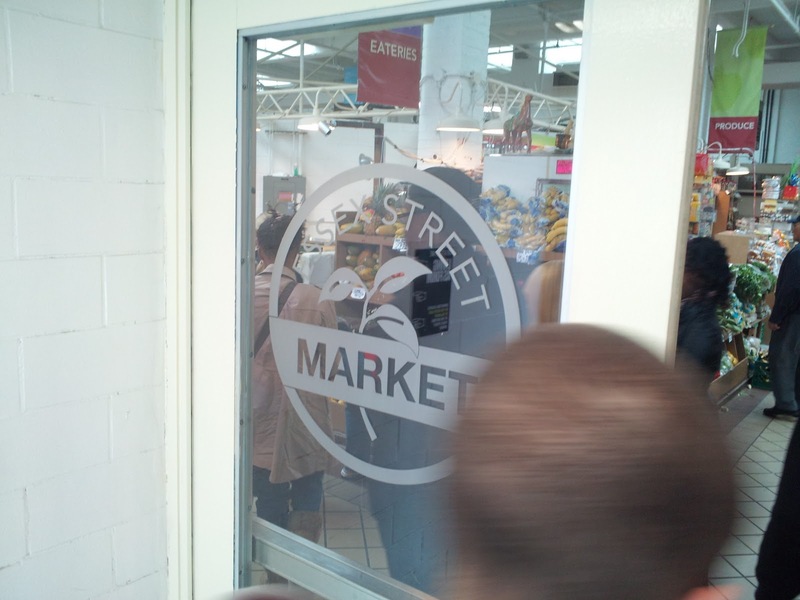 The market is a lower class market, unlike Chelsea Market, which is an upper-middle class market. I feel like I am at home in this marketplace. The prices are nice and low, the variety of food is great and there are dessert stands!! You know what that means? CUPCAKES! Before walking out, I made sure I didn’t leave empty handed. 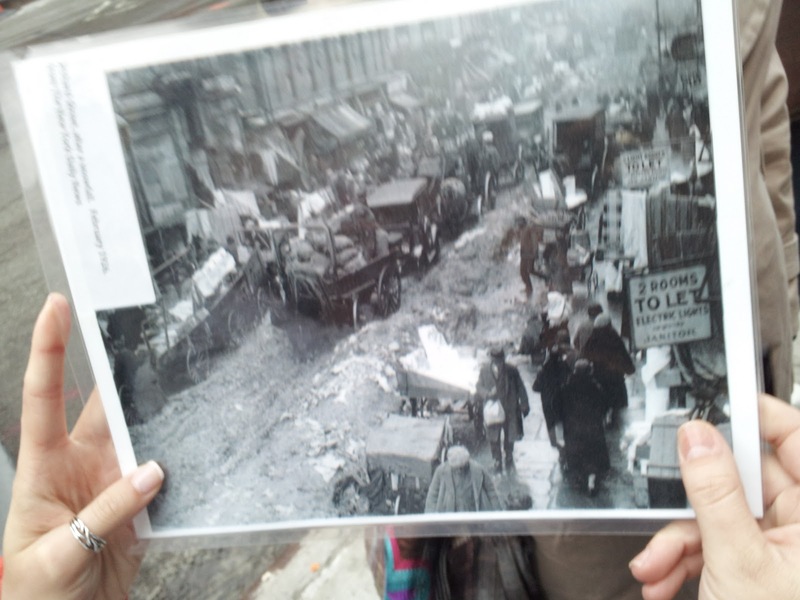 We had an appointment with a guide to take us on a tour of the tenement buildings. 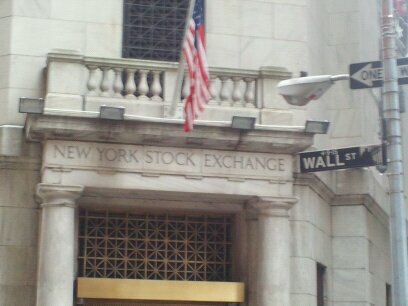 I was super excited because I have always wanted to check these buildings out. The woman who gave us a tour was Irish. Her ancestry shows that her family came to the United States and settled in tenements similar to the ones she is giving us a tour in. 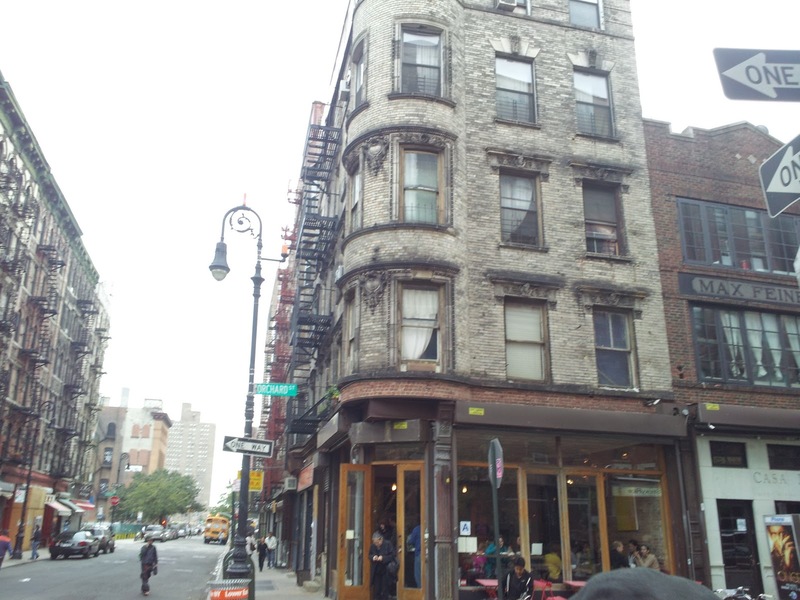 Walking around the block, she tells us that millions of people cycled through tenement buildings over the course of the late 19th and early 20th Centuries. The families never settled in these apartments because of the urge to move out due to living conditions. 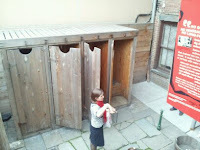 The first pie ce of history that the guide showed and discussed with us was the toilet houses. These were wooden latrines that actually had some kind of sewage system. Having a sewage system was a sign of greater sanitary conditions for that particular building. She then brought us upstairs into the building itself and had us sit in a “parlor” where we watched a short film about the living conditions of the time; the stories were told through Irish song. We then wandered through the apartment and saw a bedroom, toilet room, and a room dedicated to the mourning of the loss of a child. We also saw some artifacts left behind in the building. It was pretty interesting to see how immigrants lived after their long voyage to New York. Was it worth that type of unsanitary standard of living? We stopped in at a bar called Tom and Jerry’s. The bar is located on Elizabeth St in NoHo and is a different bar than those I’ve been to. 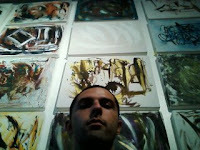 This one is artsy in style and hosts a collection of artists’ paintings and other pieces. It’s more of a place the neighborhood goes to rather than an attraction, according to our interim teacher Ms. Ruby McDonald. We had a drink which was refreshing then we scooted on over to Congee Village. 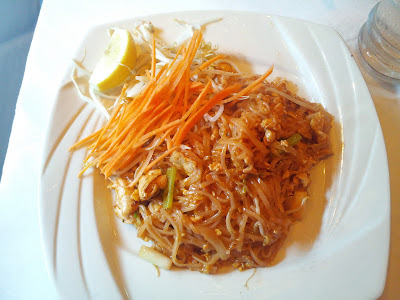 Although I now think that Pa Thai is my all-time favorite dish, the Chinese cuisine we had at Congee was delicious. From soup to chicken to rice to vegetables, the list goes on and on. 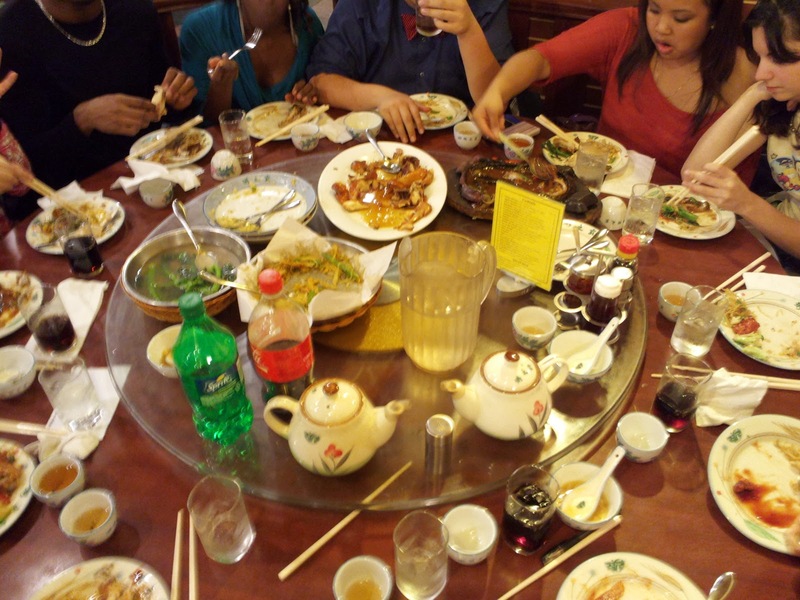 We got so full from all the servings of dishes. I just want to take this time to formally thank Mike and Meritta for lunch!! We then met up with our next guide who took us around town. 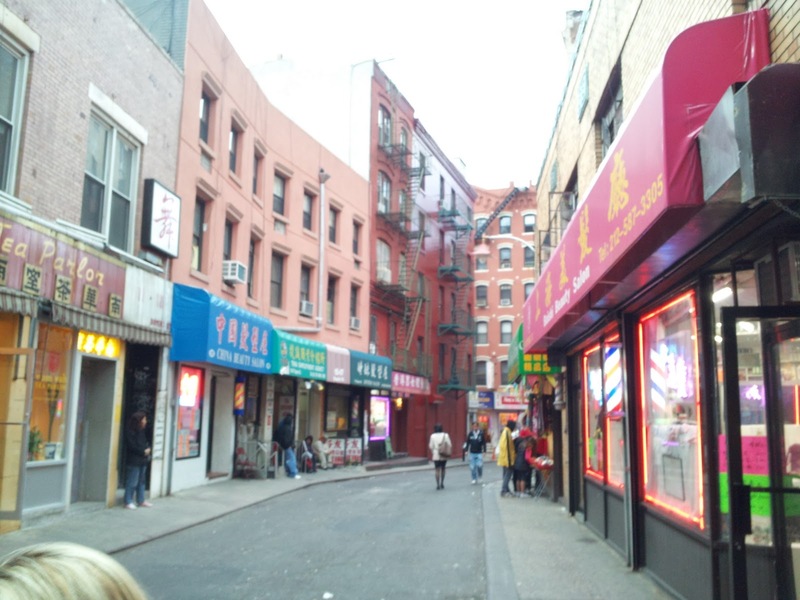 We went from the Lower West Side, through the Bowery, Little Italy, and then Chinatown. We saw a few buildings built in the late 1800s, early 1900s that showed the culture of the time as well as the group of people who were living in the neighborhood during construction. 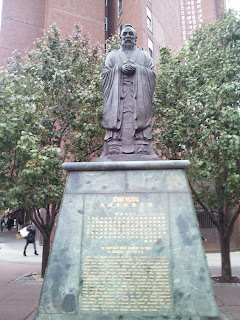 The most interesting neighborhood that stood out to me during the tour was Chinatown. It was so intrinsic and full of good stories and interesting facts. 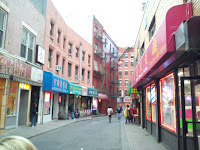 For example, Chinatown hosts one of the narrowest and one of the steepest streets. On the small, narrow street, history shows that there was so much crime due to many underground passageways that the criminals would escape through. COOL! The guide completed the tour at Columbus Park and showed us a picture of what the area looked like before, and we compared it to the industrious present. Times have definitely changed in the neighborhood. The last time I visited the Lower Westside was when the Twin Towers were erect and there wasn’t a terrorist in sight. I was young and ignorant, I really didn’t pay attention to my surroundings nor did I value the architecture as much. I passed through Chelsea before, but I only caught a glimpse of some housing facades. This time around, Mike and Meritta are really going to get us into trouble. 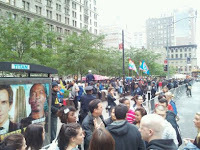 With Occupy Wall Street in progress, we were going to take part as observers… I think we are not going home anytime soon. It’s the slammer for us. HAHA well I’m excited as always to venture into the jungle of brick, stone, metal, and glass. 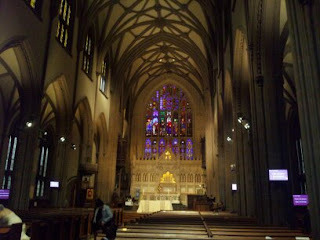 ﻿﻿﻿﻿﻿﻿﻿﻿﻿﻿﻿﻿﻿﻿﻿﻿﻿﻿We were led to Trinity Church, a serene setting. Outside the holy establishment was a tree. Yes, it was a large tree. I took fun to it for it was upside down and many were taking a picture of it. I was pretending I was coming out of a jungle of sorts. 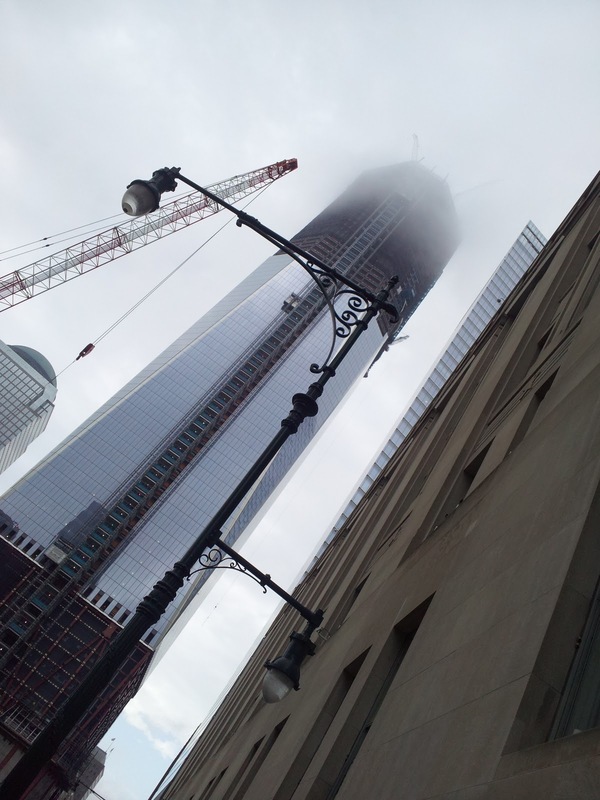 Well, Mike then said it was a petrified root of one of the World Trade Center trees. I then proceeded inside the church feeling like an idiot. Well the inside of the church was magnificent, it was active as well. People came there to take part in prayer while others came to take tour of the structure. Outside the church was an old cemetery which dates back to the late 1700s, according to one headstone. That creeped me out, so moving forward. 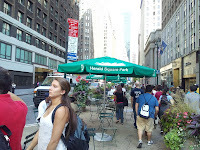 Down the street at Zuccotti Park, Occupy Wall Street was in full effect and police enforcement in the area was of top concern. Mike and Meritta would have not cared if we got locked up, in fact they probably would have laughed and carried on about it. We just listened to what the nice police officers told us to do, which was take a picture and keep moving. Before we were allowed to get deep into the park to look around and ask questions, we met up with this knowledgeable man named Tom Trotier (I don’t know if I spelled his name correctly, close enough though). Tom told us that the protest was one that is a social justice movement. It is a “byproduct of the crisis of capitalism” and that the middle and lower class, which consists of 99% of the people in the United States, are suffering from the 1% controlling the economy. Tom said, as well as what other people brought up in the media, that 400 of the richest people in the United States own 10% of the American economy. This number shocked me completely and almost made me want to jump in the park and protest myself, or maybe get comfortable with one of those 400 people. 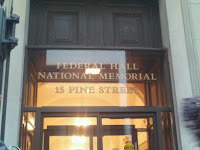 The excitement was too much for us, so we walked to Wall Street and passed by the New York Stock Exchange and visited the Federal Hall National Monument. 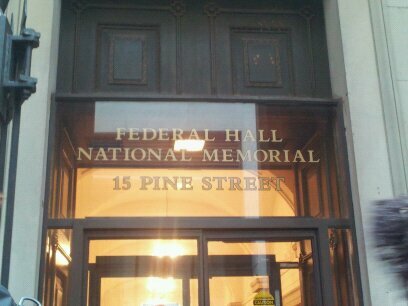 The Federal Hall was something else. It is so rich in history and was preserved very well. There were so many pictures and artifacts that threw one back to 1790. The Alexander Hamilton Customs House was also pretty neat. The artifacts there were also well preserved and taught me much of how things were done in the beginnings of U.S. civilization. We took a little walk through Battery Park, which happens to be my first time there. I was able to clearly see the Statue of Liberty, Ellis Island, and the NJ Transit Museum (I am proud to have shared some information to the class about that). The views were amazing as we walked to the Irish Hunger Memorial, interestingly built, and to the World Financial Center. It was just breath taking. Just a little bit up the Hudson River, we visited the Poet’s House where I think I held the world’s oldest book. 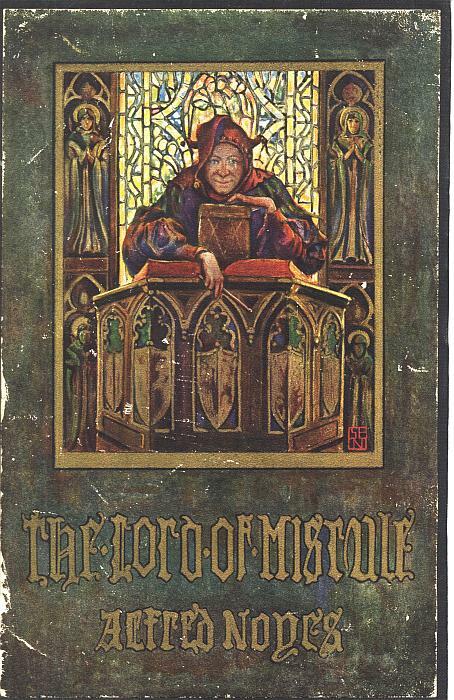 It was called “The Lord of Misrule.” It is a collection of poems by Alfred Noyes and I read about two poems during our visit. To me the poems were so complex in their meaning, so I’m guessing times were different in 1915. Today’s poems are pretty straight forward in their connotation. So here is what Meritta did to us kids, make us walk ONE HUNDRED MILLION TRILLION MILES all the way to Chelsea. It was unbelievable! The whole way there Kolin, Henry, and I were singing and rapping, spitting rhymes, and throwing down beats. We had so much fun as we walked north along the Hudson River. After what seemed like days, we arrived at the Chelsea Market. This is the home to many eateries and grocery stores. We were able to relax our feet and enjoy a bite to eat. 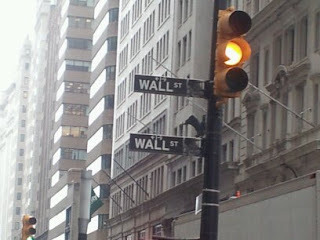 I inquired to what exactly was the Market before it was established. Meritta, being an expert in the area told me that the Chelsea Market was once home to the old Nabisco Factory in the early 1900s. My mouth dropped. This old factory I was standing in has been remodeled into an authentic indoor marketplace. I looked down under my feet and could see the old floorboards just painted over. So cool! 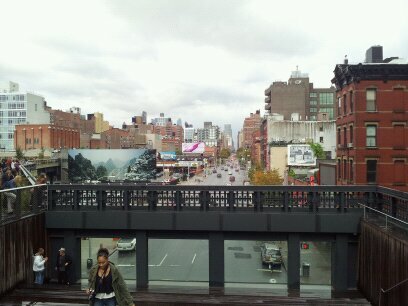 We climbed some stairs to the High Line. I’ve heard of this elevated walkway and now I’ve been on it. It was done up nice and had some water fountains and pretty plant beds, benches and lighting. I liked it. 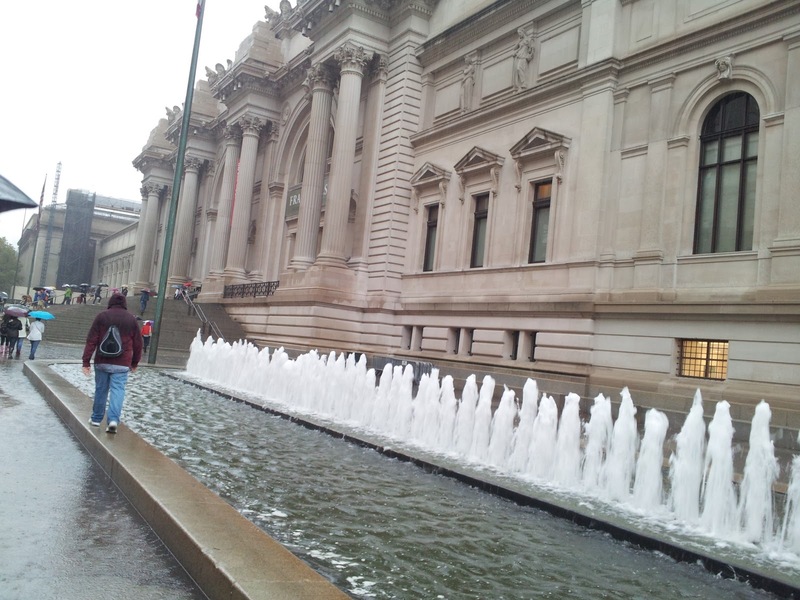 We walked four blocks north to some galleries. 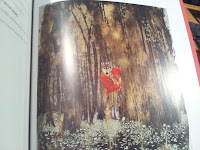 I saw some interesting paintings, sculptures and other projects. At the same time, I walked into one gallery and had to walk right back out because of the repulsive “art” inside. We will not say which one. After about a hundred galleries, we called it a night… Well some youngsters called it a night. For me and a few others, the DRINK WAS ON at The Standard Hotel. It was time to relax and enjoy the beautiful evening. Well after my Internet Browser FAILED, I was forced to rewrite this blog and the following blogs. UGH! 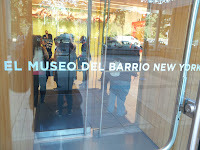 ﻿Our first stop, El Museo del Barrio, is the current location of the Spanish Harlem based museum. Before we were able to explore the facilities, we were taken on a tour of the area by a guide who seemed to be quite knowledgeable of the neighborhood. 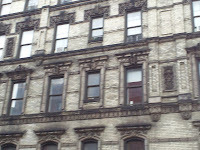 We were taken a few blocks south and around a couple of corners to the heart of Spanish Harlem. It was a busy place with a public school and plenty of small businesses. We stopped at a large mural on the side of a building. It seemed like something usual to me, given that the neighborhood is quite similar to mine in many respects. However this mural means something great to the neighborhood. It was painted by a figure that is well respected and charitable. The painting shows many aspects of Spanish Harlem from men working to women babysitting, dominoes being played outside a storefront while the women were cooking, and the kids playing outside and riding bicycles. It brought me straight to my father’s homeland in the Dominican Republic. 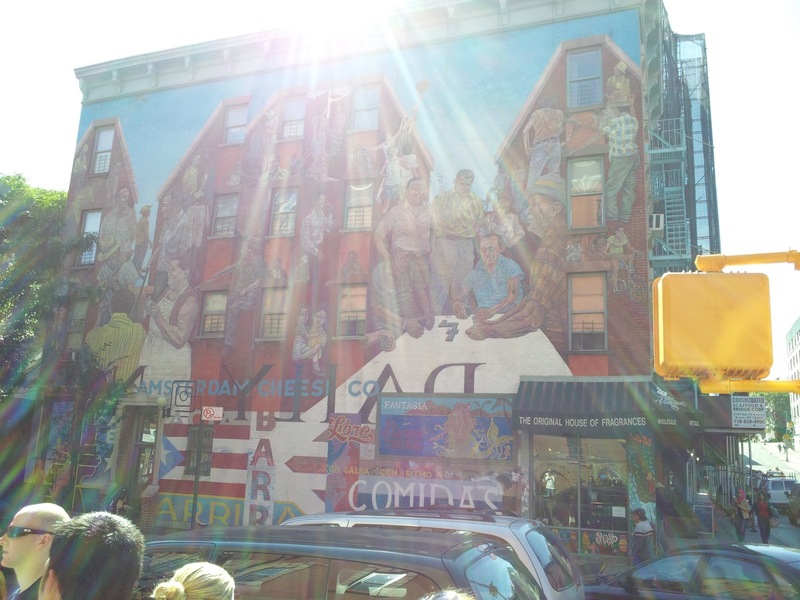 The scene is very similar there, as it is in Spanish Harlem. 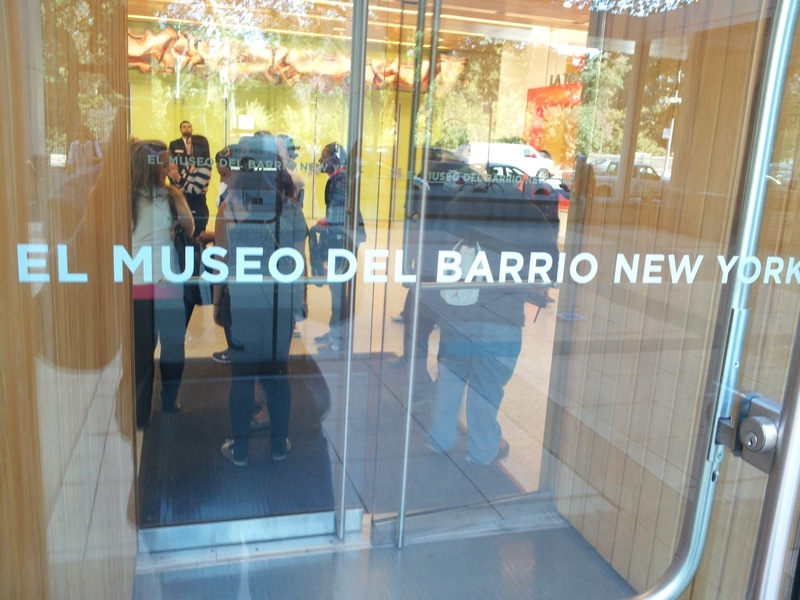 El Museo del Barrio had a pretty unique collection of art. 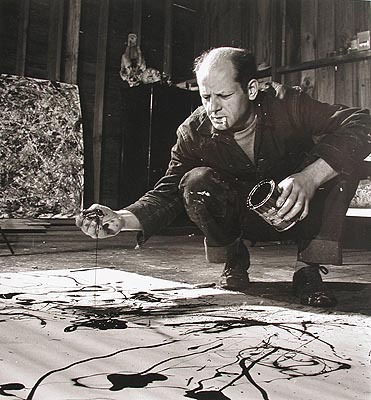 It was not your Jackson Pollock paintings, but more like an amateur, beginner collection. People have imaginations like sets of wings, layered with ideas and concepts that let one take flight and go anywhere they want to go. While at this museum, I noticed a painting that caught my attention and forced me to stop, take out my iPad, and write up a description. Unfortunately, I was unable to take a photo of the painting. So I took a little stroll over to the museum's gift shop and purchased a book that contained all the pieces of the exhibit. Yes, I guess you can call it "ghetto", no pun intended, but I have to show you guys the picture. Afterwards, Mike and Meritta decided to have us take a little break and get something to eat. I followed my professors to a little shop on a corner that cooked up some good Spanish recipes. We took a seat and I already knew what my stomach hungered for: arroz con pollo y habichuela. Mike and Meritta didn’t want to read through a complex menu so they ordered what I ordered and were they pleased! 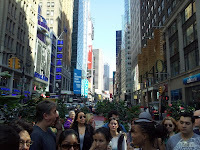 We then regrouped and walked down toward the Museum of the City of New York. I have one word to describe this place – BORING! I absolutely found the museum to be dry, although the exhibit housed great, respectful photos of September 11th and presented an awesome video of the birth of New York. So without further ado, we moved on to Central Park. Mike in my opinion, LOVES TO WALK. That or he was trying to find good cell phone reception (I am expecting a comment). We entered the Conservatory Gardens section of Central Park right off Fifth Ave. It was real nice there and quiet. We continued around this gorgeous lake that was outlined with a graveled trail, which, by the way caused my shiny shoes to get a bit dusty. 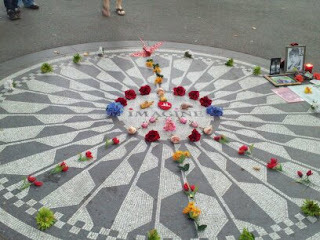 Nonetheless, we walked and walked toward Strawberry Fields, a dedication to the famous singer, John Lennon. All I have to say about this place is that it was so tranquil and peaceful. Since I missed the first two classes, I was granted the opportunity to make-up one tour. Mike and Meritta thought that Queens would be the easiest. So I called up Silvia and asked her to help me out and show me around town. First stop was the Unisphere in Fresh Meadows Park. It is a sight that I see everyday driving down the Long Island Expressway, so I really didnt see the beauty in the object until Silvia explained the whole 1964 World Fair concept. I was drawn in! The American Steele company sure proved their power and influence when they decided to build the piece. The next thing I asked Silvia was if the class discussed the three looming UFOs on sticks.... Apparantly it was not brought up but I in fact know a little bit about the project. Unsure of the names, the towers used to be home to restaurants and an observation deck that gave a 360° look around the boroughs. Silvia was enlightened and I am sure everyone else would have been! She then brought me into the Queens Museum (exciting!) to check out the Pandorum Exhibit. I was definitely taken aback by the vast beauty of this project. The entire room of about 600 square feet was dedicated to a miniature scale of he five boroughs, to detail. It was truly remarkable. 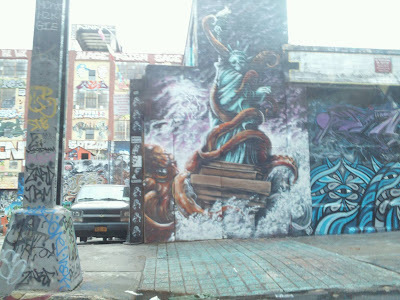 Instead of taking a hike in the freezing cold, we took my car to the next location which was a small place called 5-Pointz. 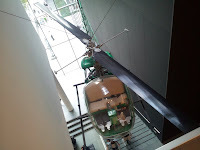 I was thinking that maybe this place is a museum of some sort. WAS I MISTAKEN. Abandoned buildings dedicated by graffiti artists to the lively, vibrant aspects of a city which they call home. 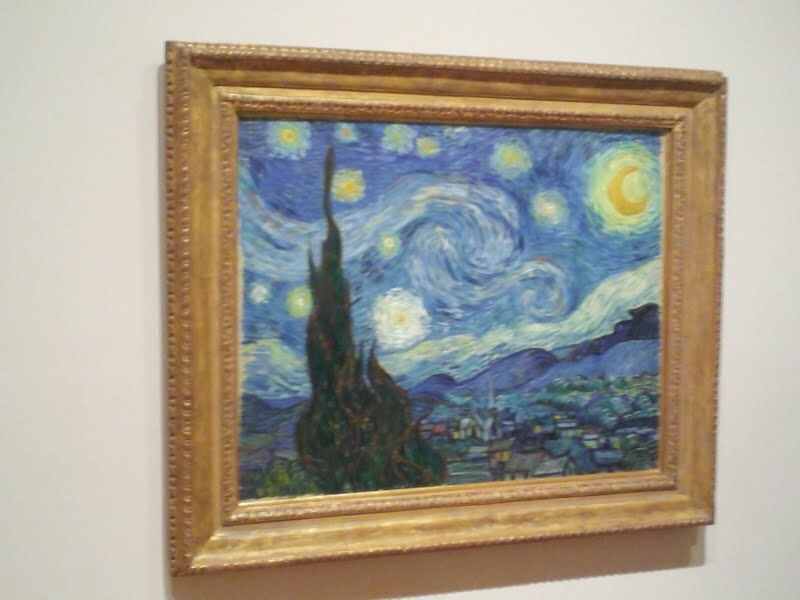 Tears nearly came to my eyes when I parked the car and took a look at grand scale of the art. It seems as if people take much of their time to work on a project they dont really get paid for. They paint their mural on the wall hoping someone takes a snapshot of it and makes it famous, then by the next few weeks it is painted over. I really appreciated this section of Queens. Final stop! The Gantry section of Long Island City. It was pretty cool to stand in the middle of what became historically an important port of Queens and Long Island. 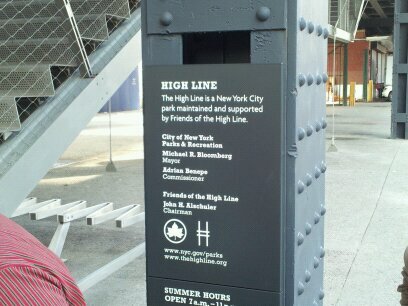 On the top of the gantries are printed the words "LONG ISLAND". I asked Silvia, why does it say that, are we not in Queens? 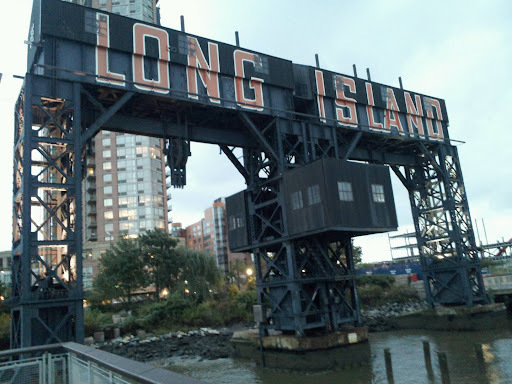 She said that the reason behind that is Queens is technically part of Long Island, hence the name of the area, Long Island City. Interesting facts, quite interesting. 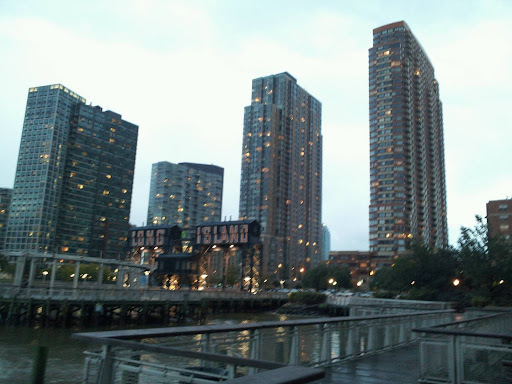 Well during our visit to Gantry Park, it began to rain so we booked it out of there and called it a night. Queens has some hidden treasures and it is humble to know that this class brings them to light. There is apparently so much to do in Westside, Manhattan. I thought the last adventure was tiring.... Mike pushed us to the EDGE by having us trek the Westside like it was a Sunday stroll through Central Park. By the time we were through I felt like Gumby and needed to recline on my couch. 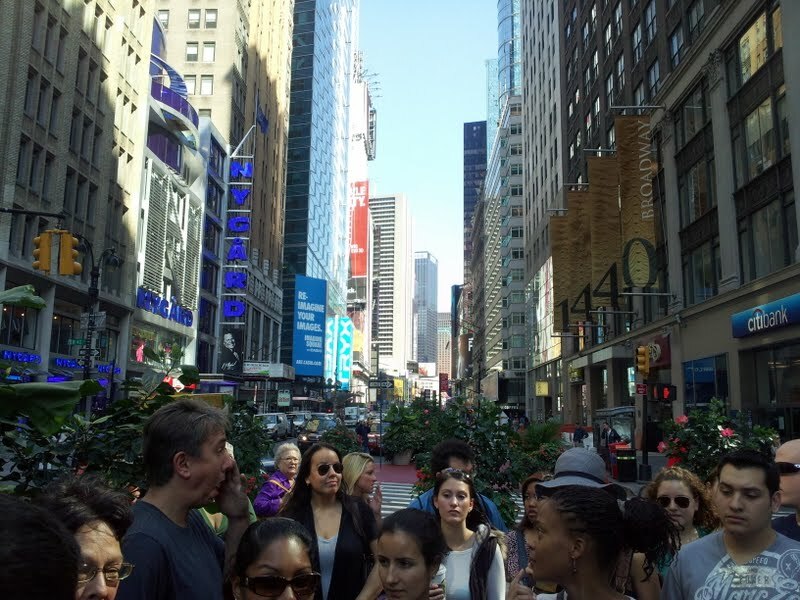 The day started with a visit to Herald Square then to Times Square. I have visited both Squares in the past, and have never took much thought to the areas. 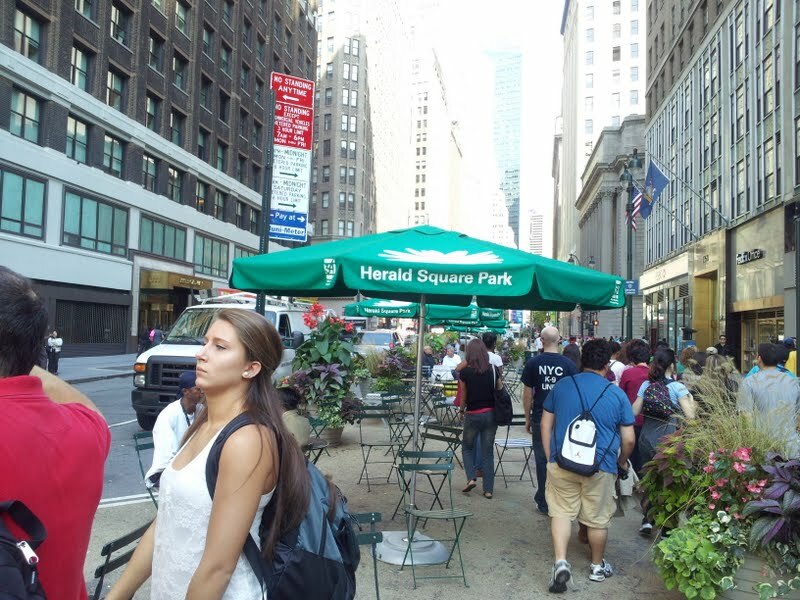 Apparently, Herald Square Park was named after the City Herald and Times Square respectively after the New York Times. Of course this makes sense. the Square and welcomed a family-friendly crowd . 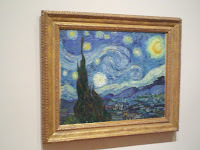 After we left NBC, we took a trip to the Museum of Modern Art (MoMA). This, I believe, was my first time here for I was truly taken aback by the paintings and sculptures displayed. My favorite paintings are those of Jackson Pollock. His work is quite...random and unique. It is that of a neat mess, for lack of better words. 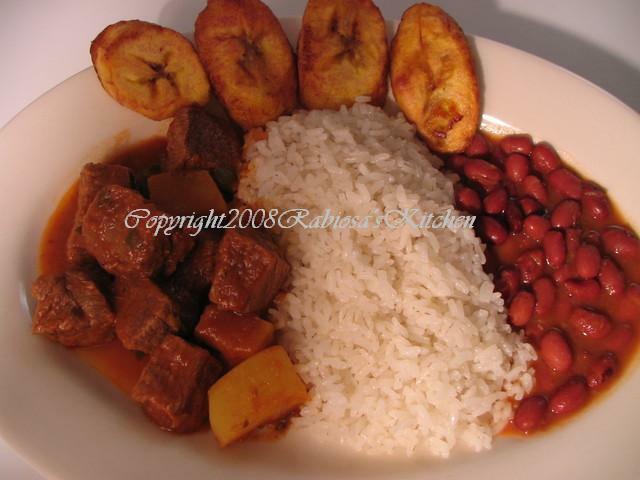 I am the type of person to enjoy the quality of many ethnic foods such as Chinese and Dominican cooking. 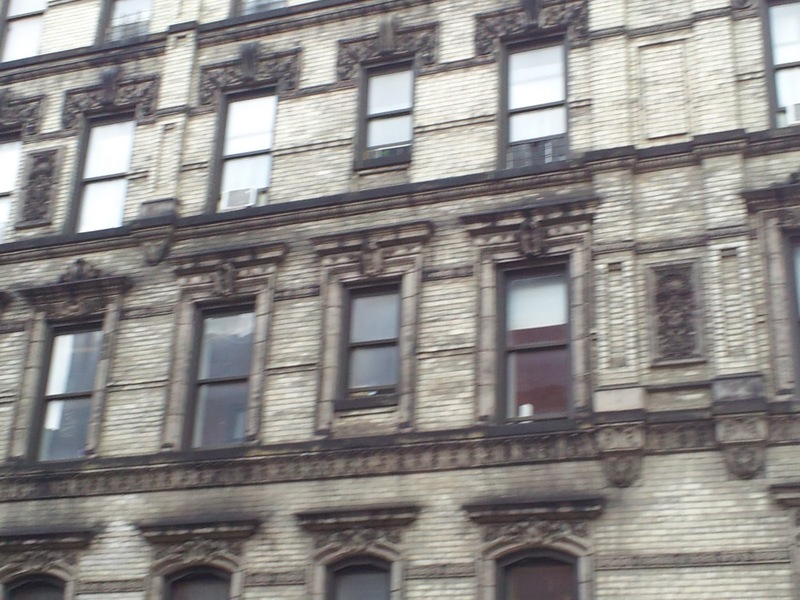 We choochooed on up to Harlem, which I feel many were intimidated by the poverty of the area. It ain't Long Island!!!! I actually felt intimidated by the beauty of the Brownstones in the area and how after many years of immigration and tenement living, that they could be renovated and worth millions. We literally walked around the block and checked out the neighborhood. It was quiet and peaceful. On the Malcolm X Blvd, there lay a ginormous church, once a temple. It is named the Mount Olivet Baptist Church. Mike had mentioned that the area was once dominated primarily by the Dutch in the late 1600s, then by the Jewish population in the 1800s. The church at first glance will seem indifferent, but a closer look at the top of the large columns prove with the Star of David, that the edifice was once a temple. 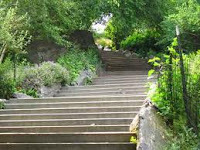 We trekked up the long set of stairs of Morningside Park that connects Harlem to Morningside Heights. Let me say something, I CAN BEAT ANYONE UP THOSE STEPS! I digress. We encountered a voluntarily homeless man trying to test our educational level by asking what the five Great Lakes were. What are the names of the five Great Lakes? Who knows.... Mike led us to the Riverside Church and then to the Grant Memorial. Both edifices were large, breathtaking structures that we unfortunately could not enter. After a long day, we were taken through Columbia University. I must say, this is a gorgeous campus. It was vast and luscious with green leaves. The campus buildings were so large and plentiful. Although it was so nice there, I would never want to enroll to Columbia, that is unless Mike or Meritta could pay the tuition costs! Final Stop: St. John the Divine Cathedral. It is the FOURTH largest church on planet Earth. Unfortunately the doors were closed by the time we got there, but from the outside I could tell it was beautiful throughout. Overall this was a great experience and I can not wait for the next tour!!! Wow. To imagine that I joined the NY Experience course for this?! Well, let me say.... AMAZING!! Since I am behind two classes, this Eastside tour was a doozy. I was so tired after all the walking that Mike made us do. However, there were some excellent sights we toured and beautiful pieces of art studied. 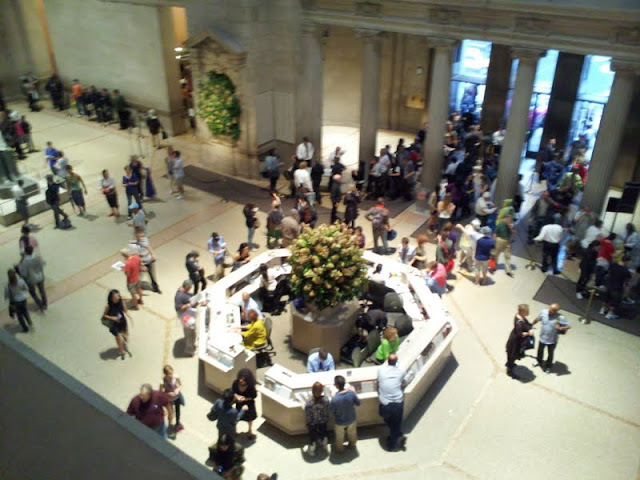 It was my first time in about ten years that I have been to the Met. Although it was a wet one outside, it was a one-a-kind experience for me. With the guidance of Professor Hazlitt, I was able to understand the meanings behind some paintings, sculptures, and drawings. The building itself was breathtaking. As an ten year old, one does not comprehend the beauty of art. We just see a enormous edifice with a giant columns in front. At 21 years old, the structure has a different, more elegant meaning. The foyer of the building was astounding and made me drop my jaw; beyond this grand lobby was just remarkable. 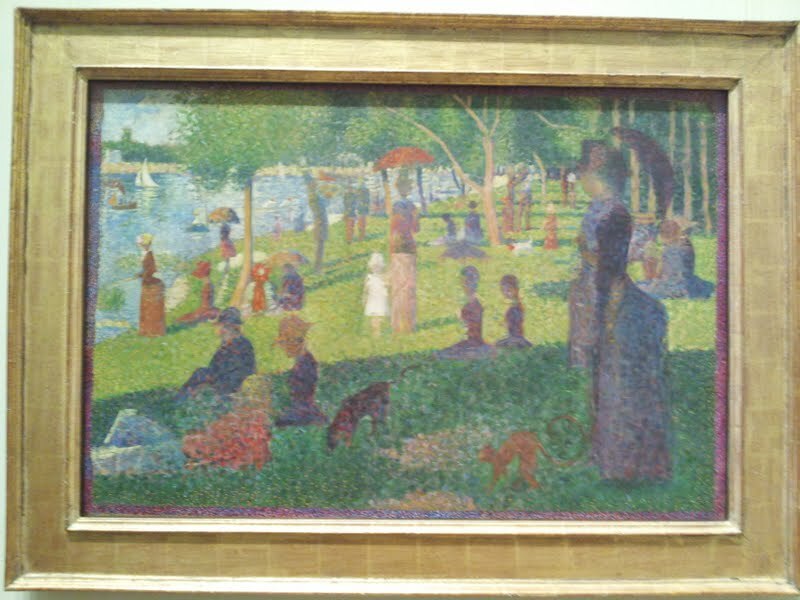 One of the paintings that caught my attention at first sight was Georges Seurat's "A Sunday on the Island of La Grande Jatte". 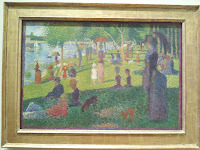 He painted this piece in 1884, which is one of many of his Pointillism pieces. As a child teachers would show us this painting in textbooks but there was no meaning to them. To have the actual piece in front of my face and to literally see all the paint strokes, was truly amazing. I am currently a college student finishing up my last semester. Woohoo!